The Lower Vasse River flows through the centre of Busselton into the internationally significant Vasse-Wonnerup Wetland System. The river is highly valued by the local community and has historically been an iconic feature of the town and focal point for recreational and social events. Improving the visual amenity and water quality of the Lower Vasse River is a priority for the wider community and the Revitalising Geographe Waterways program. The City of Busselton is leading initiatives to improve water quality, health and management of the Lower Vasse River. The Lower Vasse River is an ephemeral river (only flow in winter months) with water levels artificially maintained over summer by installing check boards at the Butter Factory, forming a still pool. The summer months bring high water temperatures, low flows and high nutrient concentrations in the river causing algal blooms and nuisance odours over the peak tourism season. 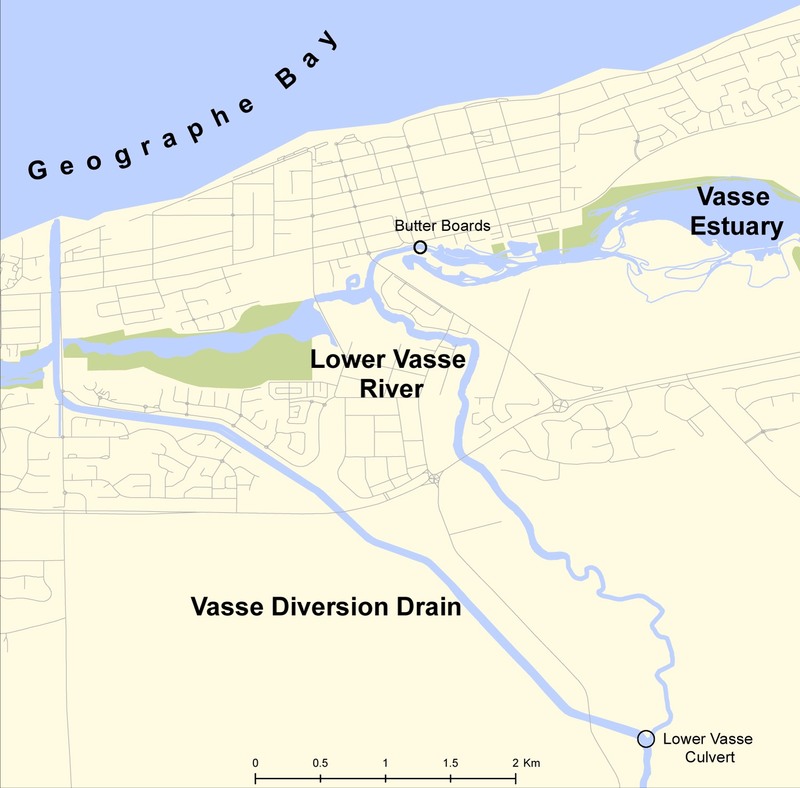 The poor water quality of the Lower Vasse River, and community concern, has led to a number of major initiatives over the past two decades including the formation of the Geographe Catchment Council (GeoCatch) and Lower Vasse River Cleanup Program. The Cleanup program focused on actions to improve water quality and ecological health of the river including major revegetation and reshaping of river banks, water treatment trials to reduce algal blooms and a successful community awareness program. Initiating major actions to reduce nutrients entering the Lower Vasse River from both rural and urban sources to improve water quality is a key aim of the Revitalising Geographe Waterways program. New science is also being used to assess options for increasing flows using the purposely developed Reconnecting Rivers model, as well as carrying out water treatment trials to assess the effectiveness of phosphorous binding clays to reduce algal blooms and determining the volume, composition and options of removal of sediments through a sediment investigation. Knowledge gained from new science will be used to develop a Water Management Plan for the Lower Vasse River. The City of Busselton is leading the development of the management plan that will identify long-term management actions to improve water quality and health of the River.